Recently, at Scum of the Earth Church, where I work, the theme of the Fruit of the Spirit has surfaced over and over again. So much so that one day while I was musing over them I thought to myself, we should have a small group: Fruity Tuesdays. We would meet on Tuesdays, eat fruit and study the Fruit of the Sprit. As one friend said, “I’m fruity enough for that.” So that’s what we did. Or rather, are doing. And I decided I wanted to share it all with you. I hope this reading is, well, erm, fruitful! I had to think about why that would be the case for a minute, why would this tattoo (other than it being beautiful) start conversations? But it suddenly seemed obvious. Those words are attractive. They’re endearing. We all want them, don’t we? I know I could do with a little more love, joy, peace, etc. in my life. And, as Paul wrote in Galatians, “Against such things there is no law.” All people approve of them and even desire them. We crave for more peace in our life. We want to be joyful. Kindness and goodness are praised. Substitutes for love can be found everywhere. And every parent knows the importance (and difficulty) of being patient. For Christians, for those who believe in Jesus and have the Spirit of God in them, these fruits are available and present every day. Reread what I just said. Think about that for a minute. Your life – my life could look like that. Especially since I just found myself wandering onto Facebook again even though I said I wouldn’t (lack of self-control). Especially since I lost my temper with Jack again last night because Ben was frustrating me (try rationalizing that). Especially since I have struggled with depression on and off for years and I wonder what it would be like to be a joyful person. Oh, I long for my life to be described in those words. It’s an ache and a prayer rising up within me along with the desperate question, how? I’ve tried. I’ve tried to be joyful. I’ve tried to be patient and loving. I’ve tried to calm my anxiety to find peace (think exercise, sleep, healthy eating, positive thoughts, etc.). Yet, my own efforts have not been enough. I need help. I need something more. Remain. Stay. Dwell. Be. Jesus is with us all the time as he promised he would be, will we be with him? I have thought about these words over and over again for two weeks. And I’ve come to this conclusion: I need more of God in my life. Church on Sunday isn’t enough. A few prayers throughout the day are not enough. Reading my Bible a few times a week is not enough. I need God all the time. I need to remain in Him and Him in me. I need Him. Period. With this fresh realization, I’ve changed a few things. First, I pray. A lot. I pray when I don’t know what to do next (that happens a lot). I pray when I don’t know what to make for dinner. I pray when Jack is crying and screaming. I pray when Ben is crying and screaming. I pray when I go to bed. I pray when I get up. I pray when I’m driving. I talk to God constantly these days and it has taken two weeks of practice to feel like I’m finally remaining in Him – at least a little bit. He is finally becoming God in my life and I’m learning that me trying to be in charge of my own life without even talking to Him was making me weary, anxious, and plain unhappy. Second, I’ve decided to talk to people about God. I’m tired of my relationship with Him being some ultra-personal land where it is only me and Him. I want to hear other peoples’ stories about their life with Him. I want my marriage, my relationship with Tim to be one where we dwell with God together. I want to experience God through other people as I hear how He has impacted their lives. I want my life and relationships to be saturated with Him. These things feel like they should be obvious. I mean, I’m a pastor, right? Shouldn’t I always be praying? Well, yes. But I got lost. Now I am seeking Him again. I am seeking the source of the Fruit I desire to see in my life. And I want to share this journey this summer with you. Hence, this blog. I don’t know what you think about God. And I’ve never been much of an evangelist. But I hope you meet the God I’ve come to know. Those fruits above, the ones that all people love and “against such things there is no law”? Those are from God because He is those things. I look forward to exploring them (and Him) with you. Let the cream cheese sit out at room temperature for awhile to soften or soften in the microwave then mix the two jars together in a medium bowl. 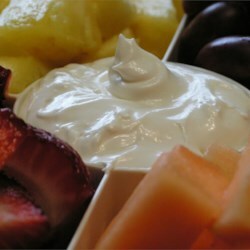 Dip your fruit and enjoy!! This entry was posted in devotional, Fruity Tuesdays. Bookmark the permalink.